It must be getting close to the end of the world, because the animals are revolting. Literally. The kitten with the two faces was what really got me worried that the end was near. Then I saw the picture of the duck with four legs. Then there's the python that ate an entire electric blanket, the circus kangaroo that escaped in Ireland and the police dog that ran over a pedestrian in a truck. Come on, something weird's going on here. It's like Marlin Perkins dropped LSD or something. Part of my columnist duties involve scanning the wire services for interesting stories to share with readers, but you wouldn't have wanted to venture into AP or the Internet in the past few weeks without a whip and a chair. Even the nightly news featured the cute little two-faced kitten born in Ohio. This kitten actually looks like Janus, the two-faced Roman god, had Janus had fur and whiskers. Scientists say two-faced cats are rare but that this one might live normally, although you never want to trust it. The boy who owns the kitten, in a fit of creativity, named it Tiger because Kkiittttyy apparently was taken. Not to be outdone by American animal ingenuity, the Chinese dredged up a four-legged duck. The duck, curiously named Tiger, does everything other ducks in China do, which is to say, resolving itself to a future of hanging upside down in a street market. (I was kidding about it being named Tiger. It's actually named Ddoonnaalldd.) The four-legged duck reportedly likes to swim, but the farmer doesn't let it do that because it's fast and hard to catch. 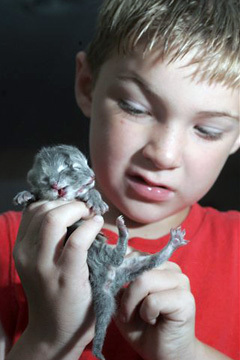 Charles Roberts, left, 6, from Grove City, Ohio, examines a two-headed kitten his cat gave birth to two weeks ago. In San Luis Obispo, Calif., blackbirds have gone crazy and are attacking pedestrians about 15 times a day. Customers have been seen screaming and running through Laguna Village Shopping Center, flailing their hands in the air and demanding royalties from the Alfred Hitchcock Estate. Wildlife experts think the birds are either protecting their nests or upset with California Gov. Arnold Schwarzenegger's lax border security policies. Meanwhile, in Ireland, a 3-foot-tall circus kangaroo has escaped and is roaming the countryside. Ireland is the last place you want a performing kangaroo to be running loose. Police in Dublin have already received numerous reports from drunken pub patrons reporting seeing a "large, juggling rat." The weird thing is that the kangaroo escaped in Kinsale, 200 miles to the south. In Kinsale, residents have reported no strange animal sightings, although a "large, unshaved Protestant with a long tail" was seen demanding a pint of Guinness at the Lucky Charms Arms. 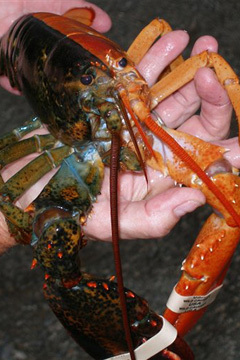 A two-toned lobster caught in Bar Harbor, Maine. The fisherman donated it to the Mount Desert Oceanarium, where staff members say the odds of finding such a lobster are 1 in 50 million to 100 million. Back in the U.S., an 8-foot python swallowed an entire queen-size electric blanket, including the electrical cord and control box. The python, named Tiger, said he had been feeling a little chilly. Just kidding. He didn't say anything. How could he? He had an electric blanket in this throat. Actually, the snake's name is Houdini, which makes about as much sense as Tiger. The blanket and assorted accouterment were removed during surgery. The Idaho man who owns the 18-year-old pet snake was happy to get his blanket back, not to mention his CD player, wristwatch and toaster oven. But our top "Animals Gone Wild -- End of World Near" award goes to Ranger, a German Shepherd police dog who managed to put a pickup truck into gear and run over a woman walking to her mailbox in Ogden, Utah. Mary Stone suffered a broken pelvis after the dog ran her over. Police Lt. Loring Draper said he left the engine running so Ranger could have air conditioning and that the dog accidentally put the car into gear. Yeah. Right. Tell it to Rodney King. Ranger is on paid leave while he undergoes psychological counseling and a driver-refresher course. He said he's looking forward to meeting Tiger (the kitten) for lunch. 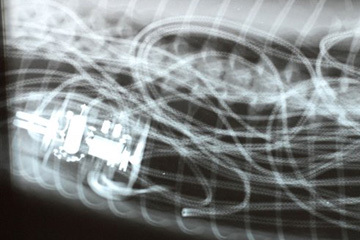 X-rays of Houdini, a Burmese python, show the control box that the snake swallowed along with a full electric blanket.